Hands-on activities are a wonderful way to teach early skills like counting! With this printable Turkey Feather Counting Activity, your little ones will have tons of fun mastering their counting skills! Counting might seem like an easy activity to us, but for young children, it can be hard to grasp. This fun activity will help your children learn all about numbers and counting! The colorful turkey is fun to count with! It is also a terrific way for your child to learn number sense, or how numbers, counting, and quantities relate to each other. To play, just add any number of tail feathers to the turkey. As your child counts them, put the number that corresponds to the tail feathers on the turkey’s belly. As your child starts to master their counting skills, let them take over more of the game! They can practice counting one by one, learn easy skip counting, and even challenge you. There are so many fun things that can be done with this game! You can also laminate the pieces to make them last longer. That way, your child can take it out over and over to play! This printable activity makes learning math skills fun. 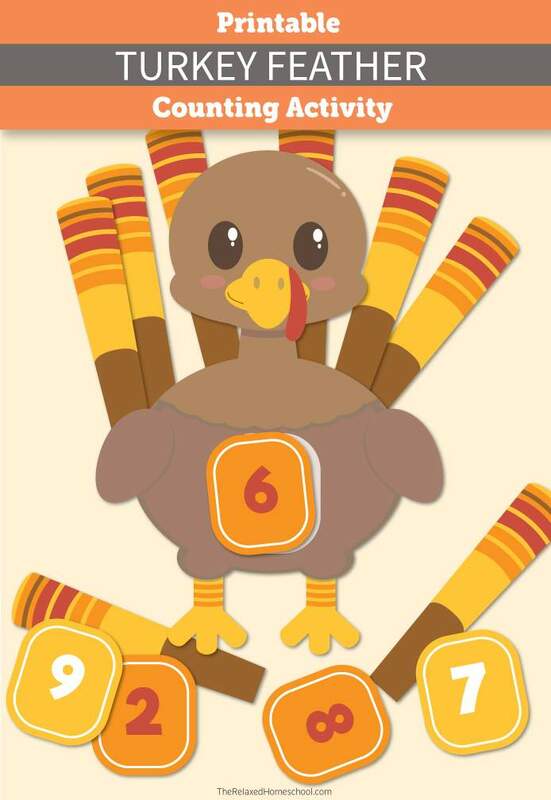 The Turkey Feather Counting Activity is also a fun way to keep all the little ones busy at Thanksgiving – just print off a set for each and let them play!